Have you considered creating a short video for your website or social media? Maybe you’ve thought about it, but you don’t want to make a fool of yourself. You’re scared you’re going to look like a stuttering fool, or draw a blank and forget everything you wanted to say. You want to be bold, and put yourself out there but you just can’t bring yourself to do it. Why invest in video (especially if it’s so damn scary)? Because they humanise your brand, they give it personality and a face for people to see and relate to. I get it. I’m terrified of showing up in videos online. But going into 2018 it’s becoming ever so important to stand up and be seen. If your competitors are doing it, and you aren’t – where does that leave you? Videos really are the new black. 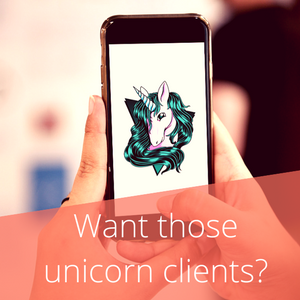 Hiring a video script copywriter is the shortcut to generating online content that engages those unicorn clients and makes them love you. Plus, videos don’t have to be expensive to produce (just use your smart phone and simple backdrop you buy online). They can be a fun way to bring attention to creative products or services and can increase cost per conversion on FB ads. And of course, they’re great for SEO. Then video might just be for you.